Chennai City entertain inconsistent Shillong Lajong on Sunday night at Jawaharlal Nehru Stadium in their first game of the I-League second leg, hoping to return to winning ways. Chennai have remained unbeaten since the appointment of Soundararajan as manager, winning one and drawing another. With the new coach implementing a new system and dropping two-time Hero of the Match winner Marcos Vinicius, they have looked lively, with Charles de Souza running the show. Despite Soundararajan's arrival bridging the gap between the midfield and attacking players, Michael Regin's role as the number 10 has left a lot to be desired. However, in light of the manager promising to make necessary changes in an attempt to further the chemistry, a new starting line-up will likely be introduced. Their opponents Shillong Lajong have been their regular selves this season, eking out wins against lesser opposition while they have come short against big boys such as Mohun Bagan, Bengaluru and Aizawl. Coming off a 1-1 draw with table toppers East Bengal, they will be keen to return to winning ways; they have won four of their last six I-League outings, losing narrowly to DSK Shivajians at home. Afghanistan international Haroon Amiri, who returned to training recently, will operate as the shadow striker while Karanjit Singh will guard the Chennai goal again, after a prolonged spell on the sidelines. Shahinlal Meloly and Edwin Sydney Vanspaul will drop to the bench, making way for Nandakumar. Shillong coach Thangboi Singto has taken 19 first team players with him leaving a host of under-22 players in Shillong. Zodingliana Ralte is the only absentee as he battles a minor injury. Shillpng Lajong won the only game between these two teams earlier in the season. Soundararajan-Chennai City: Shillong should be high on confidence after scoring two goals past us in the reverse fixture. However, they did that without our best players. 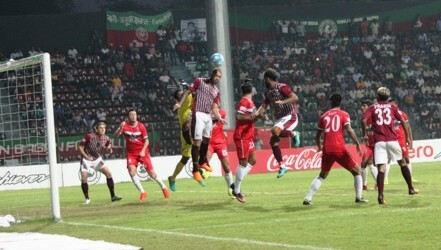 Their recent draw with East Bengal should have handed them a major psychological boost. We're facing one of the toughest teams in the I-League tomorrow. We'll go all out and look to secure a win." Thangboi Singto-Shillong Lajong: Chennai have numerous experienced players, who are household names in Indian football. They have established names and exciting local talent. If you give them time, they will definitely be able to beat any team in the league. We've faced the same problems they are facing when we qualified for the I-League a few years ago. Tomorrow's game will be tough, but we'll look to give our best and leave smiling and with points." Haroon Amiri-Chennai City: Amiri's return from injury is certain to serve as a huge boost as his versatility and experience will ostensibly help them up their game. Despite playing predominantly as a defensive player, he will operate in the hole behind club's top-scorer Charles. His passing range may turn out to be what Chennai have need to convert good performances into wins. Shillong Lajong: Asier Dipanda Dicka: Scoring seven goals in nine games, the Valencia youth product has been a revelation this season. 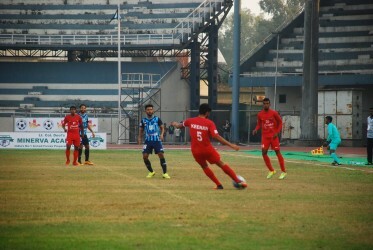 His arrival has greatly improved Shillong's attack, which often looked their Achilles heel last season. Against Chennai's organised back line, though, he will need to put in a shift. Chennai City: Karanjit; Debabrata, Echezona, Ravanan, Yumnam Raju; Nandakumar, Devadas, Ganesh, Prasanth; Amiri; Charles. 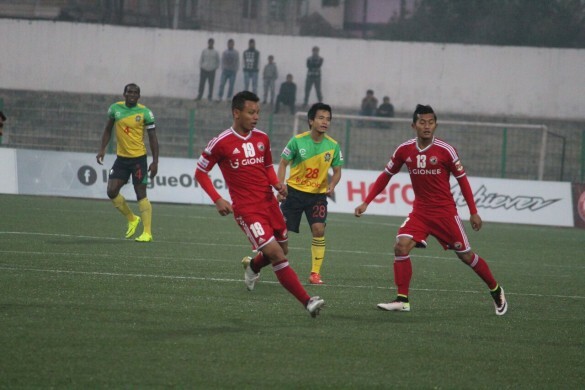 Shillong Lajong: Vishal; Shadap, Nim, Sana, Pritam; Yuta, Issac; Redeem, Samuela, Bipin; Dicka. Ten 2 telecasts the game live. You can also watch the game online on Ten's official website. Alternatively, you can read the match report on Khel Now.